Imagine the rejuvenation of Cornwallis Park into an active space, a space that enables community programming, supports active use, and is a family friendly space. A park with a purpose! Please join us on Wednesday, May 28th from 7:00 – 9:00 pm at the Atlantic Room of the Westin Hotel, for a presentation by staff of the conceptual master plan for Cornwallis Park, followed by a community discussion about what our priorities are in the rejuvenation of this park. Cornwallis Park was built by the Canadian National Railway in conjunction with the Nova Scotian Hotel in the years 1928 to 1931. In 1931, a citizens committee was given permission by the City of Halifax Council to erect a statue of Edward Cornwallis by renowned Scottish American sculptor J. Massey Rhind to commemorate the founding of Halifax. The statue was dedicated in June of 1931. In the late 1970’s a community playground was added to the south side of the park. For seventy years the park was federally owned but maintained by the City of Halifax. The title of ownership of the park was transferred to the Halifax Regional Municipality in the early 2000’s. 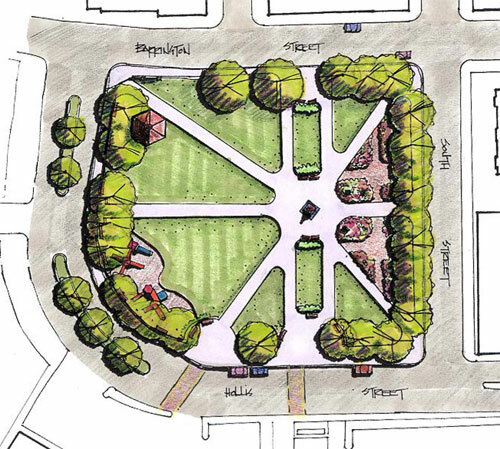 Previous planning studies call for the rejuvenation of Cornwallis Park as a key public open space to serve as a catalyst for revitalizing downtown Halifax and attracting new residents and businesses to the area. HRMbyDesign and the Downtown Halifax Secondary Municipal Planning Strategy identify the park as the southern gateway for downtown and the anchor for the Barrington Street South Precinct. Park Visioning Exercise Design Presentation, May 1, 2000. Next Steps HRM’s first focus will be the redesign of the children’s playground. Further consultations will be held this summer with local stakeholders.